One of the most replicated (so called “aftermarket”) dials for vintage Citizen watches is the dial for the wellknown “bullhead” chronograph. The original bullhead dial, the one with an octagonal SS case is either black with white sub-dials or white with black sub-dials. If you see one with a different color, for sure, it is not original. Sometimes you can find one that looks just the way it should, but let’s wait a minute. Let’t put on the magnifier and compare the original dial with the fake one. I have posted two photos. The fake dial is the one where you can see the entire watch, on the left, all the details are from an original dial, on the right. Click on the pictures1 to magnify them. 1 – the “500” is not where is supposed to be on the fake one. It is miss-placed at the 38th marker, not at the 36th, as it should be. 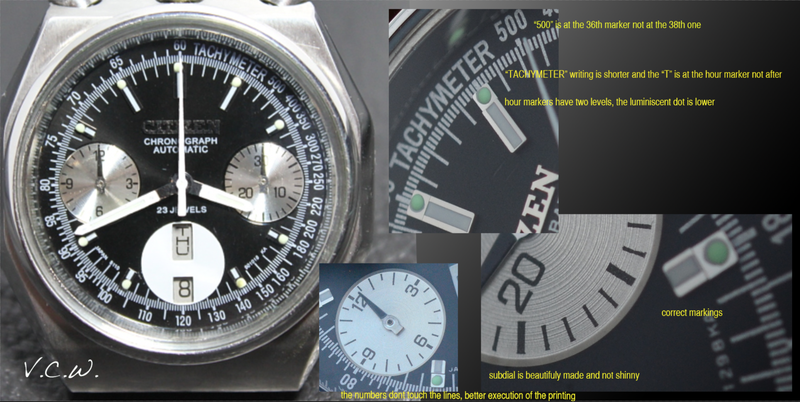 2 – the “TACHYMETER” writing on the aftermarket one is too long (this is why the “500” is misplaced too) and the second “T” on the fake one is after the 1 o’clock hour marker as for the real one the “T” is before the hour marker. 3 – the applied hour markers should have two levels, on the lower level is the luminous dot. On the fake dial the hour marker is flat, without this particularity. 6 – The tachymeter scale numbers are not allowed to touch the other lines printed on the dial. The execution lack finesse at the fake dial. For sure there are other mistakes too but these are the obvious ones. As a conclusion, I suggest that any buyer and Vintage Citizen Collector should take it’s time (and the magnification) and not waste all this money on fake watches. Remember that “Aftermarket” means “Fake”. This entry was posted in automatic, Citizen automatic chronograph, Citizen chronograph, day-date and tagged aftermarket chronograph dial, aftermarket dial citizen, aftermarket fake, automatic citizen chronograph, Bullhead 67-9356, citizen chronograph fake, Citizen Chronograph fake dial, citizen fake dial, citizen vintage chronograph, fake citizen chronograph, fake citizen dial, How to spot a Fake dial, How to spot a Fake dial Bullhead 67-9356, How to spot a Fake dial Citizen. Bookmark the permalink. Well,I am sure you are going to find a nice one! Keep an eye on the forums, dedicated sites and on the facebook page and for sure one will come out. Good luck! just bought this Citizen Bullhead (https://uhrforum.de/citizen-bullhead-t268821) and now I’m a little bit concerned regard the unusual yellow dial. Would be great if you could take a look at it! Yes, after reading your and other blog entries I’m also pretty sure that this yellow dial is an aftermarket dial, at least a well-made one. The seller did not state in a single sentence that the watch is in original state and I didn’t ask him explicitly, so I’ve to live with that issue. The only good thing is, that I really love that yellow look. Why do you keep referring to aftermarket dials & bezels as fake? As they arn’t, as they are 100% legal in all OECD countries, even with trademark markings. The fact is exemptions exist for aftermarket parts, they were bought in for the benefit of motorists, so auto repairers did not have to pay inflated prices for OEM parts & motorists could go to any garage rather than just workshops of licensed dealers of the brand in question. Trademark exemptions were created to so aftermarket parts suppliers could still supply parts that have the auto makers names on it – for example a die cast alloy or plastic moulded radiator grill that has a Ford symbol cast into the middle of it. Although these exemptions were brought in for the benefit of motorists & independent repairers, they apply across all industries. Because of these trademark exemptions it is quite legal for anyone to make aftermarket parts for watches, even parts that contain the trademark of the original manufacturer, this is the same in all OECD countries that haved signed up to GATT. So even a aftermarket dial with even Citizen written on it, let alone Rolex, is quite legal. It only becomes illegal if it gets misrepresented as a OEM part. You know Porsche knowingly had a ‘904’ in it’s museum temporarily (while another one was getting work done) that had both a replica frame & body & primarily aftermarket drivetrain, with wheels made in Australia to the same design as the original, but it was built so accurately, they had no problem with it sitting there. So why be a parts snob if Porsche isn’t. In fact the vast majority of luxury cars made in the inter war period had aftermarket bodies on them too. & it would surprise me if there was even one car that won the Pebble Beach concourse that didn’t have aftermarket or hand made parts in it. Because they are fake. They are made by third parties in order to cheat and get money out of it, pretending they are original, without the original manufacturer knowledge and they are using the original branding too. They are not made to specifications and are fake. This is why I call a fake… well… a fake. Hi. 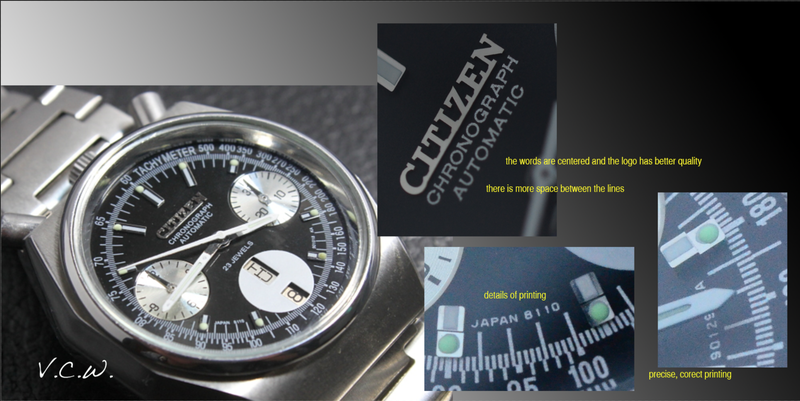 I have with me Citizen Chronograph Automatic 8110. Can I contact you thru email so I can send the pictures? Thanks! Hello! You can upload them here.